Situated on the Sacred Plaza in the Urban Sector of Machu Picchu, the Main Temple is an impressive rectangular shaped building consisting of 2 lateral walls and 1 rear wall. The base of the temple is made up of large lithic stones which support more regular sized and precisely carved stones. The Main Temple features a total of 17 trapezoidal shaped niches which were most likely used for ceremonial offerings. The rear wall of the temple also has 6 large stone pegs, which were probably used to hang decorations or aid in some way the rituals carried out at the temple. During Inca times it was said that the Temple was adorned with colourful mantles, emblems and mummies of the most important Inca leaders. The temple supposedly housed an effigy of P’unchao, a divine sacred symbol made of solid gold representing the Inca God Wiraqocha. 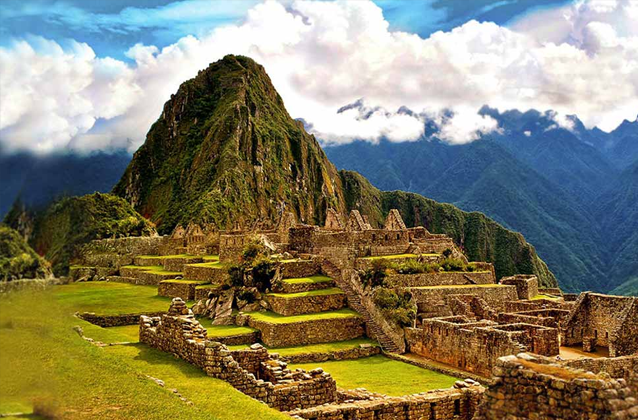 When the Incas abandoned Machu Picchu at the time of the Spanish conquest, they took with them all the most important artefacts leaving behind just the stone structure which we see today. Various earthquakes over the years have undermined the structure of the Main Temple causing damage. It is most notable in the rear right hand corner of the building, where the stones have separated and moved downwards.